Big changes could be on the horizon for Florida’s emerging – and oft-delayed – CBD industry. Several medical marijuana bills that made rumblings this week in the state’s legislature may supplant the much-criticized CBD law passed by legislators in 2014. If successful, the bills promise to create a much larger potential patient pool, boost the number of available MMJ business licenses and potentially open the door for more minorities to get involved in the industry. At the same time, advocates have launched a renewed bid to legalize medical marijuana via the ballot box next fall, which would lead to immense business opportunities but also create huge questions about the future of the CBD program. Add it all up, and there’s a ton of uncertainty in Florida – but also a lot of potential. “Everybody’s goal is to deliver a regulatory framework where there is business compliance, and (one) that supports a safe and tested product, but where there is enough volume that people who need it can get it and that it’s affordable,” said Jeff Sharkey, president of the Medical Marijuana Business Association of Florida. On Monday, state Sen. Jeff Brandes filed a broad medical marijuana bill that would allow cultivation, processing and retail facilities, essentially replacing the entire CBD licensing system. On Tuesday, a Senate committee advanced a bill sponsored by Sen. Rob Bradley that would add medical marijuana to a list of drugs under the so-called Right To Try Act, which allows terminally ill patients to try experimental drugs not yet approved by the Food and Drug Administration. A House version of the bill also passed through a subcommittee this week. The Brandes bill might be too tough for lawmakers to swallow, so observers don’t really think it stands a chance at this time. Optimism is higher for the Bradley bill, which would essentially expand the CBD program. The current CBD law allows only marginal amounts of THC so that patients won’t get “high,” a provision that has been criticized by medical marijuana advocates as too restrictive. Only people with severe forms of epilepsy, cancer and amyotrophic lateral sclerosis can participate in the program, translating into a patient pool of about 20,000 people “tops,” Sharkey said. But by bringing terminally ill patients into the fold, the Bradley bill would expand the patient population to between 100,000 and 150,000, Sharkey estimated. The bill would also abolish the cap on THC concentration. Additionally, an amendment to the House version of the bill calls for increasing the number of cultivation licenses from the five allowed under the current CBD law to 25 by Oct. 1, 2016. Many observers say these types of changes are needed. 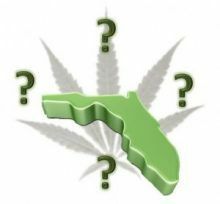 Florida’s CBD program has faced numerous setbacks and delays since lawmakers approved it in the summer of 2014. State officials have yet to name the five licensees under the program – 24 nurseries submitted 28 applications – though a decision could finally come by the end of the month. Under the CBD law, the only companies eligible for licenses are nurseries that are over 30 years old and can grow more than 400,000 plants. These companies are also allowed to open dispensaries and deliver CBD. Nurseries that receive a license will have to fork over a $5 million bond, create a detailed business plan and cover a host of initial expenses. That means companies will face startup costs of between $7 million and $10 million, Sharkey estimated. Critics feel the strict provisions shut out scores of entrepreneurs and patients, while the high startup costs and low potential patient count will make it difficult for license winners to survive. Under the proposed House amendment to the Bradley bill, cultivators wouldn’t have to be operating nurseries, which would open the door for investors or other entrepreneurs who want to grow cannabis. If the number of licenses is increased, it’s not clear if the state would have to reopen the application process or choose licensees from the existing pool of applicants. Louis Rotundo of the Medical Cannabis Association of Florida said his group welcomes the Bradley bill but believes the number of licenses awarded should be kept to five. The Senate bills join a third bill in the Florida House of Representatives that is similar to the Brandes proposal. So do any of these measures stand a chance of passing? Rotundo was less certain that any of the new bills will pass. “Don’t take any of these bills too seriously yet, we have a long way to go,” Rotundo said. Progress on the bills hasn’t persuaded United For Care, another state group advocating for medical marijuana legalization, to stop work on a ballot measure it hopes to have before voters next November. That bill would create a much broader medical marijuana program along the lines of what other MMJ states have passed. “We made it very clear to legislators that we were willing to pull back on the ballot measure if they passed a reasonable bill. But they didn’t even pass any kind of measure,” said Ben Pollara, campaign director of United for Care. Pollara said the current efforts in the legislature come too late, though dismissed the idea that lawmakers are trying to undermine legalization measures. “I don’t think they’re nefarious. I just think they’re incapable,” he said. Pollara estimated that his group had between two-thirds and three-quarters of the 683,149 petition signatures needed by a Feb. 1, 2016, deadline to get the legalization measure on next year’s ballot. A measure to legalize medical marijuana in Florida failed at the ballot box by a razor-thin margin last year, but the chances are high a similar proposal will pass if it makes the ballot in 2016. This article speaks for growers only in the state of FLorida. What about stores that want a license to sell Cbd hemp oil products. What is the requirement for them to obtain a license . And then after the MMJ is passed in the election .How will the stores who operate as a herbal oil distribution only no smoke. How to obtain license? At the present time, there are no “stores” that can get a license because only the state-approved farms on the list can “plant, harvest, manufacture, sell, and distribute” products to patients. We are coming up on a crucial time in Florida — namely, having the general public vote to approve full-strength marijuana in November 2016. We need this vote to pass to give patients full access to necessary medical care and medication. Based upon the climate here in Florida, I do not anticipate that “stores” that are not affiliated to the licensed farms will be permitted to open any time soon. Can you say state-run monopoly???? So, to answer your question directly — there is NO way established under Florida law, at the present time, to apply for a license to sell products.